Bend, Or - The Bend Veteran's Day Parade is turning 15 years old this year, and one woman has been behind its heart and soul from the beginning. Rabbine Harpell, Owner of Azura Studio felt it was her "call to duty" to not only recognize the "silent breed" of local veterans but to also act as an advocate to help the homeless and disabled. So what is her inspiration? "My dearest friend, who passed, Mike Ward, State Commander Disabled American Veterans, worked tirelessly for veteran causes," she says. "He was a great inspiration to me. It's been my heart's joy to volunteer my services as PR consultant planning special military events and fundraisers." What many don't realize is Bend's first Veterans Parade started in 1999, after many years absence. Rabbine points out WWII Veteran Mike Dolan on November 11th at 11 a.m. walked down Wall Street in his Veterans of Foreign Wars uniform carrying an American flag. "(Dolan's) solo march was the spark that 'resurrected' an official Veterans Day parade since 2000," she said. "We lovingly named Mike Dolan the 'Father of our Veterans Day Parade.'" This year will be Rabbine's 14th year working on the Veterans Day Parade as a member of the parade committee. "It felt wrong to the veterans that they had to put on their own parade and struggle to find the funds," she said. In 2002, Steve Esselstyn, Special Events Liaison Bend Police Department asked her to please help them. As Principal of Jubilee Productions, PR and Event Planning, she was determined to prove our Veterans are worthy of honor even in a small town like Bend, and the dream to build a parade as large as the city of Albany began. "With public donations and participation, today we are the 2nd largest Veterans Day Parade in the State of Oregon drawing thousands who line downtown streets," Rabbine said. So why should the parade be so important to the community? "It's a reflection of our town, our character; a clear witness of the gratitude we all share for the service and sacrifice of those who defended our freedom, " Rabbine said. 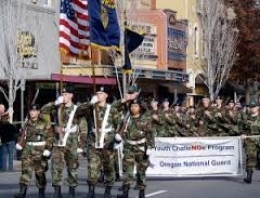 Azura Studio is a proud Sponsor of the Veterans Day Parade of Bend and supports Diasabled American Veterans; homeless veterans; first responders; and Oregon National Guard Youth Challenge Program for at risk youth.